Early spring is an exciting time – everything is growing and the days are longer and warmer. Our three horticulturists give you advice for early to mid-spring. Jennifer Stackhouse gives the low-down on what to do in September and October as well as why she considers almonds and cloves clever crops. Melissa King reveals why she finds old-fashioned varieties of carrots both colourful and tasty and tells how to plant persimmon and quince during the spring months. And, Claire Bickle tells us all about the wonderful world of worms; what they get up to and why they’re so important. With summer approaching it’s also a timely reminder on how we can save and use water wisely. We tell you how easy it is to go grey – using the wasted water that gurgles down your plugholes and how it can be reused on your non-edible garden. We also give you a rundown on what you need and what’s available in water tanks and accessories. If you are interested in keeping hens, Megg Miller explains all about one of the most popular breeds of chickens – the Sussex. On an environment note - what if the world’s “safest” herbicide, glyphosate, turned out to be one of the most dangerous? Jo Immig explains all about this widely used poison in our news feature, The Grapevine. And, in our popular From Garden to Table section, discover how to grow, harvest, store, preserve and cook Thyme, Rainbow Chard, Watermelon and Spring Onion. 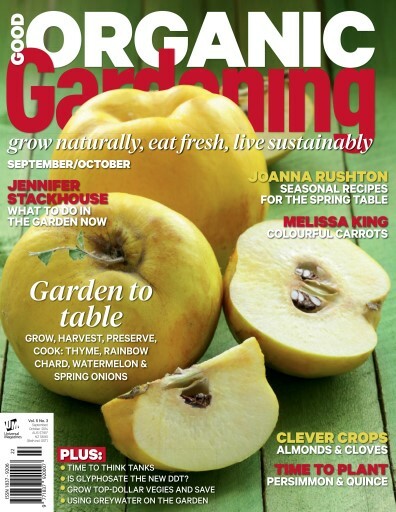 Growing advice is from horticulturists Jennifer Stackhouse and Neville Donovan (Greenpatch Organic Seeds) and delicious recipes are from The Organic Chef, Joanna Rushton.